All meetings begin at 6:30 PM. In addition, members are welcome to bring their horses at 5 PM for meetings at the fairgrounds. Remember that members must attend at least 4 meetings if they plan on showing at the fair. This form will be handed out at project meetings, but it is also available here. This page replaces page 13 in your 2019 Handbook, and reflects the new requirements for work hours and show/clinic participation. 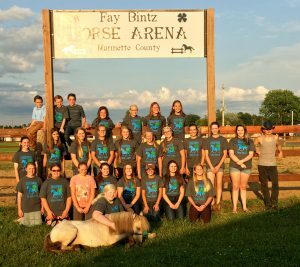 •All members planning to exhibit at the Marinette County Fair this year need to participate in a horse show or clinic with the horse(s) they are planning to bring to the fair, prior to the fair in August, 2019. 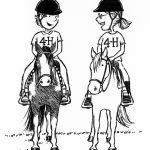 This is to give the horse and rider more exposure to show conditions and other horses. 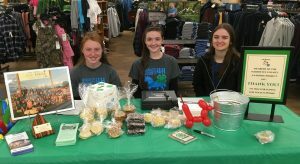 •All members planning to exhibit at the Marinette County Fair this year need to help support the work of the Horse Project by working at least three hours in project work opportunities. These may include fundraising, painting, and fair and show prep. We will keep track of the hours worked on a form for each member. There is a lot to be done and we need everyone’s help! The forms needed to document members’ show/clinic participation and the hours members have worked are available on this page. Members of the 2017 – 2018 project at a summer meeting at the fairgrounds. Olivia and Kayla Hemstock and Lindsey Albaugh helping out at Tractor Supply during 4-H Clover Days in October. December 2018 – Members and their food contributions for the SEED food pantry at the Peshtigo School District. The Marinette County Horse Project is off to a great start this year. Our meetings are the first Monday of the month at the Grover Town Hall. Meetings are lively and include snacks and a brief educational presentation given by youth. We like to remind people that you do not have to own a horse to be in this project. 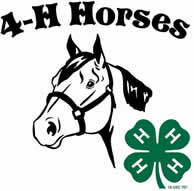 Our goal is to help youth members grow in confidence and leadership through learning about and working with horses. Attending meetings gives kids a voice in all aspects of how our project is run, in addition to getting to know new friends and learning new things to become better horse people. Join us! Included on this page you will find our Handbook. This is full of important information and includes contact information for our Leaders and other resources. Please reach out to your club or project leaders for any questions you may have.